Cable socket grip is used for holding the cable during the pulling operation. 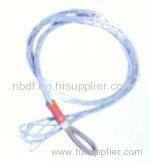 it is made of high strength galvanized steel wire. Group of Cable pulling grip has been presented above, want more	Cable pulling grip and Cable socket grip, Please Contact Us.